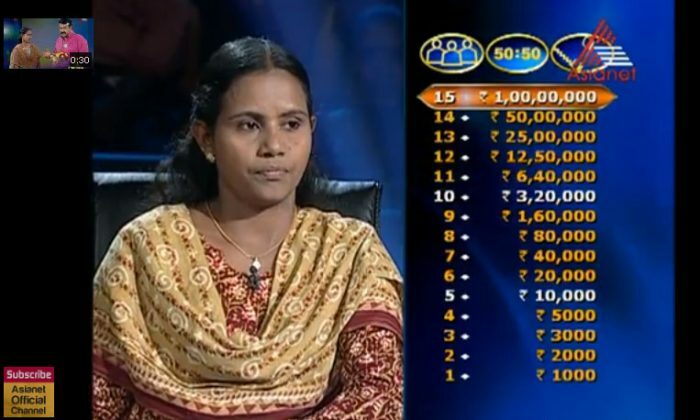 A wife of a porter won $1, 86,289 in a reality show in India thus shaping her endurance and hard work into a memorable rags-to-riches life story. Sanuja Rajan, a 38 year old mother of two, won the prize money in a reality show “Ningalkkumaakam Kodeeswaran” aired on Asianet TV, in Kerala, on Wednesday night. She answered all the fifteen questions correctly and became the first women to win the show. Her life is a story of sheer grit and perseverance as she never gave up facing various pressures of life and stood by her dreams. In an interview with Indo-Asian News Service (IANS), Rajan said that she and her husband belong to different communities and thus after marriage they didn’t get any support from their respective families. In traditional Indian communities marriages happen within the community and are mostly arranged by families. Currently, Rajan works as an assistant in state capital’s collector office and lives in the outskirts of Thiruvananthapuram city, where the village council helped her to build her small house. IANS also reported that Rajan became paralyzed after the delivery of her son and came back to normalcy with grit and determination.